Was surprised to see no talk about this on the forum, so decided to start it up. The wallpapers were added on later. 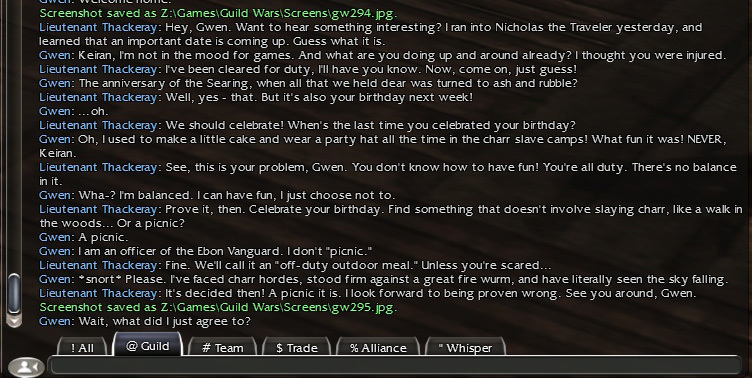 If you click on the fliers on the guildwars.com page they send you to a facebook account with quotes in a role playing character manner. The Shining blade camp was added in game secretly with the April 2nd update. 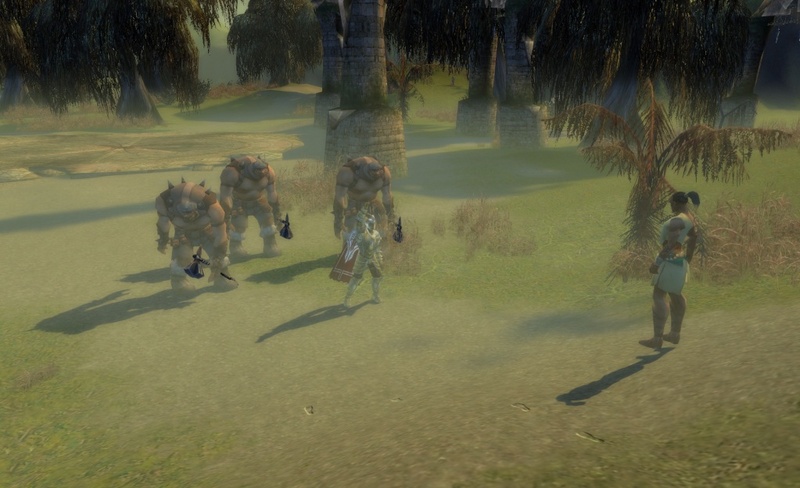 Anet is getting ready for a big, Huge update! 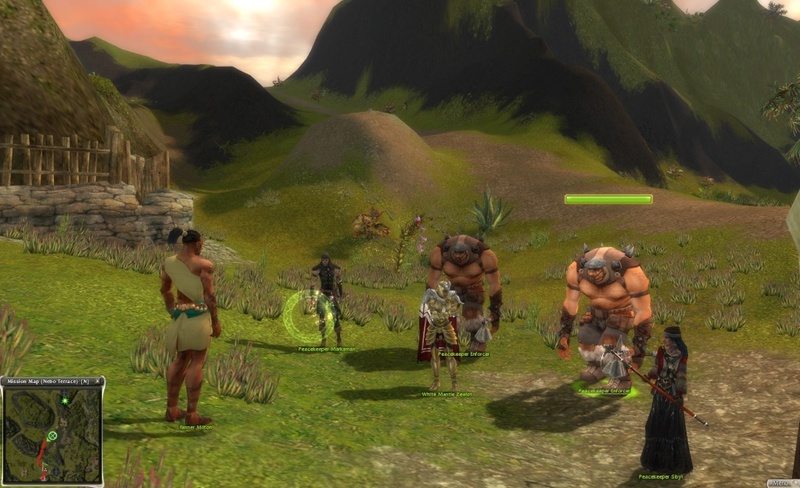 It's located in Dakutu Village, the village is in Talmark Wilderness in Tyria. 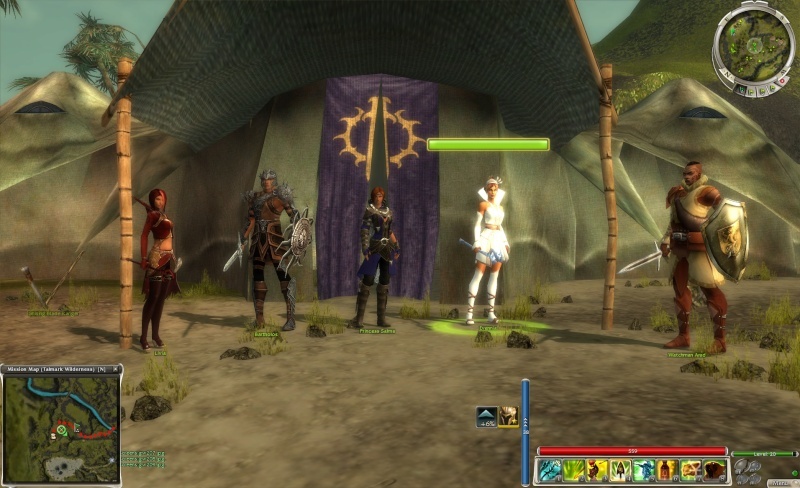 Do you think anet has big plans for this? 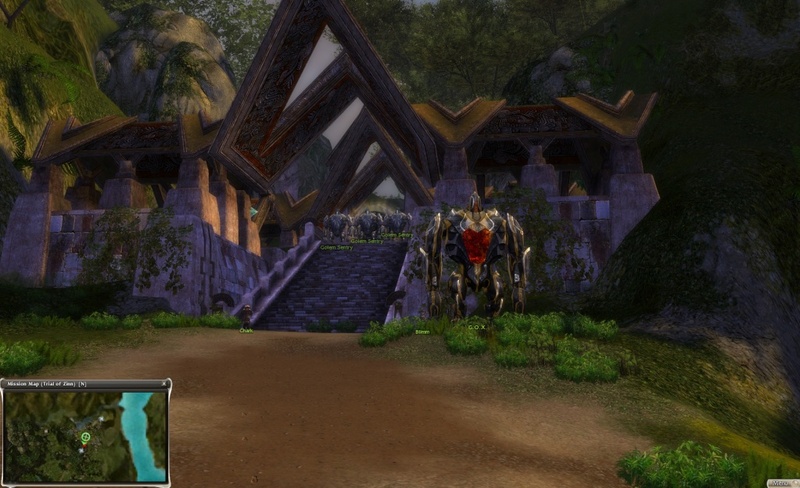 or is it just another "village" like the ascalon settlement? I can smell more grinding on the horizon, I think. I am still not done getting the Heavy Eq. bags I wanted for my characters from the last big update. That, of course, isn't a complaint. More content is always good stuff. Way to take care of customers even if there is no ongoing revenue stream. And this might be more real content. Not just grind... or so I hope. Better save up some cash, some new items will be introduced. eek! I hate when the page gets stretched like this! There's no way to resize this? If not that's okay. So Leohan, can you explain exactly what this new shinning blade camp is, or will be? There isn't really any info on it yet, I don't think. It seems obviously to be something in advance of the 5th year anniversary though. I'm sure it will do something more once the 5th year mark hits, and they'll probably implment more updates that go along with it. In other words, we just gotta wait and see. 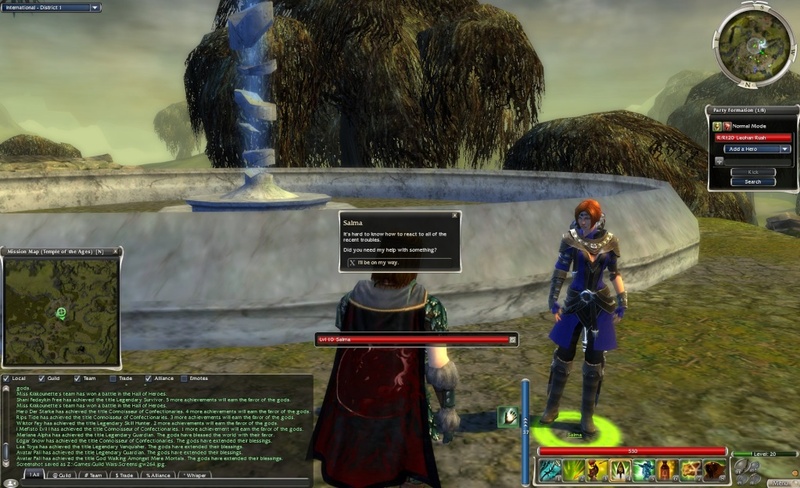 Yes Anet so far is doing a basic online scavenger hunt with the GW1 website and facebook, were we have to discover clues as a community, it's all just an advertising campaign to get the community talking. 90% of information is just forum talk nothing is 100% fact in what I'm a about to say. The Shining blade camp is there because on April 23 the birthday update will happen and than the war begins were we can pick up the quests and rage war over Kryta. They added the camp in secret to go along with the Lore of the Shining Blade are freedom fighters and they have a hidden camp. 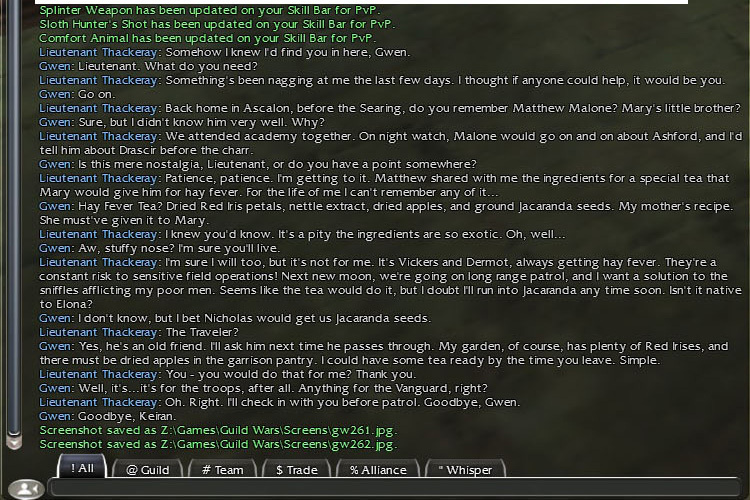 The Gwen conversation goes along with a quest line were your supposed to give Thackeray items to win over Gwen's heart, this goes along with the Lore because I suspect that in GW2 there will the children of Gwen. Gwen needs babies so we can have Gwen 250 years from now. Here's the wiki page about it him and the quest. Wow! thanks for all the great info! Think what Kaeda is trying to say is the War in Kryta page on guildwars.com got updated on April 8th, now it has actual useful information, teaser image is gone. Bear witness to the trial of the century! The renowned asuran artificer Zinn will stand before the judgment of the Arcane Council for orchestrating an assassination scheme using golems of his design. 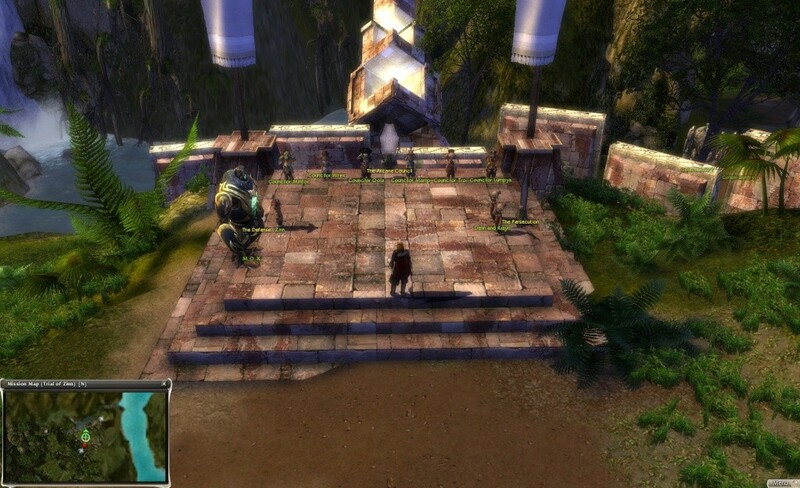 Speak with Chark outside of Vlox's Falls to attend the trial. 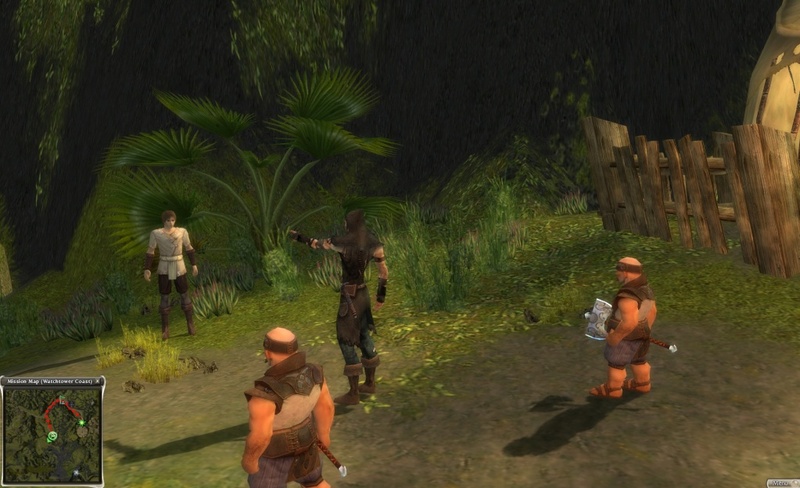 These NPC's were added in on April 8th in the area of Kryta and you can find some easter eggs in some areas with dialogue between them and the citizens of the land. These conversations do not pop up every time you go into an area. It may take a few tries before you get one or find one. Right oustside ToA's door between Brother Mizar and Greves the Overbearing. 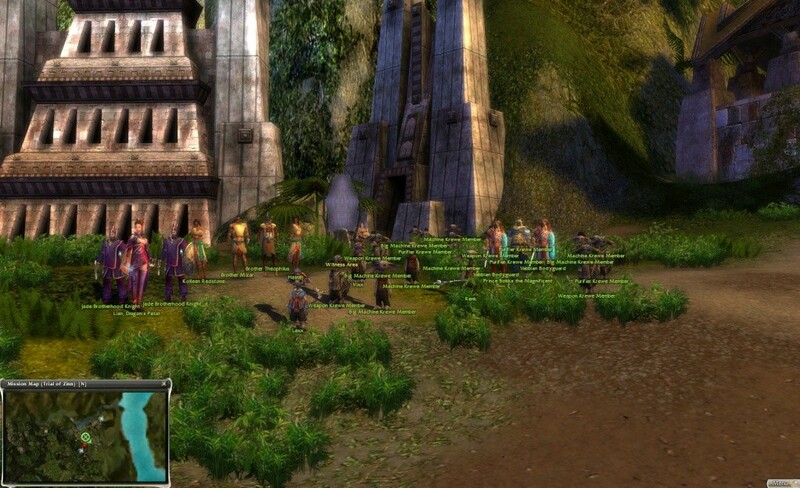 Leave Beetletun into Watchtower Coast; between Farmer Fanella and a Peacekeeper Enforcer. Have any of you see the peacekeeper builds ? May be not too bad, I beat em, but try HM, they turn from level 20 to 30. I wonder how u could VQ the area with a large group of em like outside Beetletun in Nebo Terrace? impossible unless some elite team build!? Hope u get the lucky chance they don't spawn! (i believe random chance of spawning). It might be in our best interests to go VQ this area now before they add more and makes it harder. New dialogue for the Shining Blade Camp with the April 15th game update. Leohan wrote: New dialogue for the Shining Blade Camp with the April 15th game update. Ah, that was there when the peacekeepers came out =D. There may be a new change with the update though. 1st shining blade bounty. and theres a few other new things to enjoy. Info on him is there. its another source of the packages. Oh boy, 5am. fun stuff. Ill be headed out in about an hour. I may do one more run for him, to get another package for myself. Polka-Dotted top (Purple or White), or Babydoll Frock?